This post is sponsored by Vital Proteins®. As always, all opinions expressed here are my own. Thank you for supporting the brands that help make Pumpkin ‘N Spice possible! 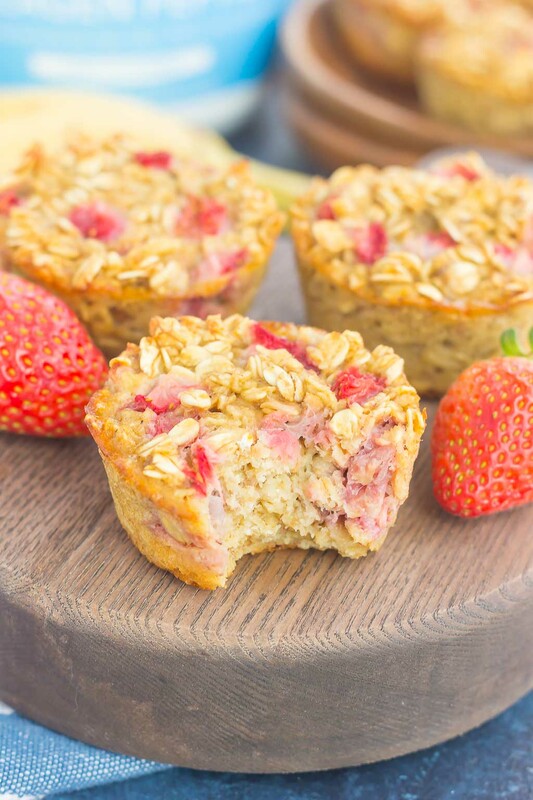 These Strawberry Banana Baked Oatmeal Cups are the perfect make-ahead breakfast for busy mornings. Packed with hearty oats, fresh strawberries and sweet bananas, this simple dish is easy to make, healthier, and loaded with flavor! My breakfast game has been going strong lately, and I’m proud of it! From these baked pancakes, to that creamy smoothie and this savory oatmeal, I’ve got my breakfasts under control lately. It’s especially important to me because I often skip out on breakfast. Unless you count coffee and the occasional container of yogurt a good start to the day. And don’t get me wrong…coffee is much needed everyday, but by mid-mornings, my stomach is screaming at me for more than just liquid caffeine. 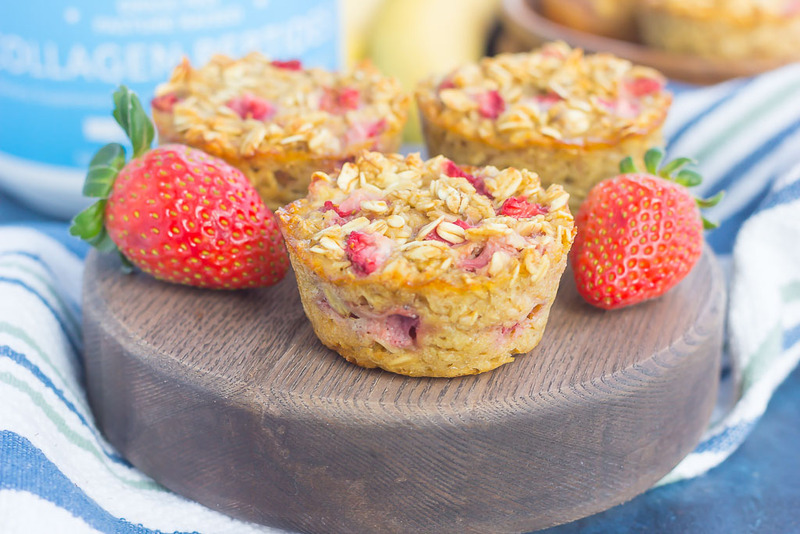 So I turned to one of my favorite go-to breakfasts lately…baked oatmeal cups! If you remember these Apple Cinnamon Baked Oatmeal Cups from October, you know that it makes the most deliciously cozy breakfast for just about any day. The hearty oats, sweet spices, and fruit fill you up and keep you going all morning long. And that’s just what I need! But, to kick up my oatmeal game just a bit, I added in Vital Proteins® Collagen Peptides. If you follow me on Insta-stories over on Instagram, then you know that I’m a Vital Proteins® lover! 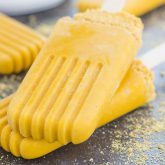 Remember these Pumpkin Pie Pops and this Spiced Gingerbread Latte? Yep, made with Vital Proteins®. It’s an unflavored protein powder that is beneficial to your body in terms of improving your hair, skin, nails, joints, and ligaments. I’m thrilled to be partnering with Vital Proteins® again because I truly believe in the benefits of this collagen powder. 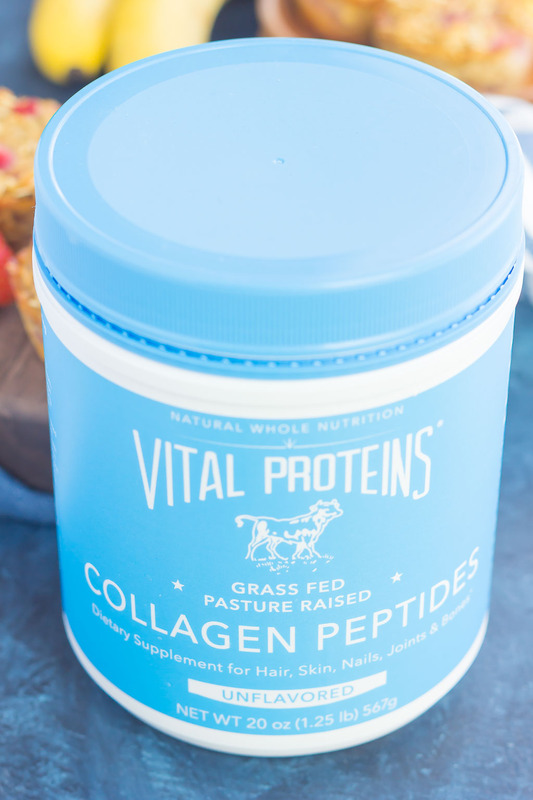 Vital Proteins® Collagen Peptides helps your body boost collagen in a natural and safe way. By using this collagen daily, it can provide great health benefits for you. And one of the many things that I love about Vital Proteins® is the variety they provide. 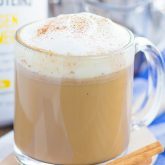 From collagen peptides, to collagen creamer, matcha collagen, beef gelatin, collagen beauty waters and more, there is a type of collagen for everyone. 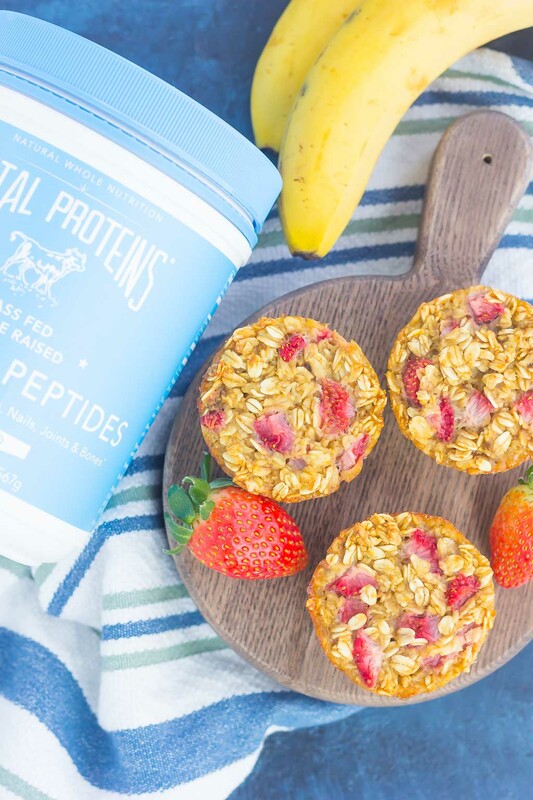 And since I’m trying to be more mindful about breakfast, I knew these Strawberry Banana Baked Oatmeal Cups, made with Vital Proteins® Collagen Peptides, would be perfect for a healthier breakfast. If you’re a fan of baked oatmeal, then I guarantee you’ll love these oatmeal cups. It makes the best breakfast, mid-morning snack, or late afternoon treat. I can get my daily dose of Vital Proteins® Collagen Peptides in my coffee and in my breakfast. How good does that sound? 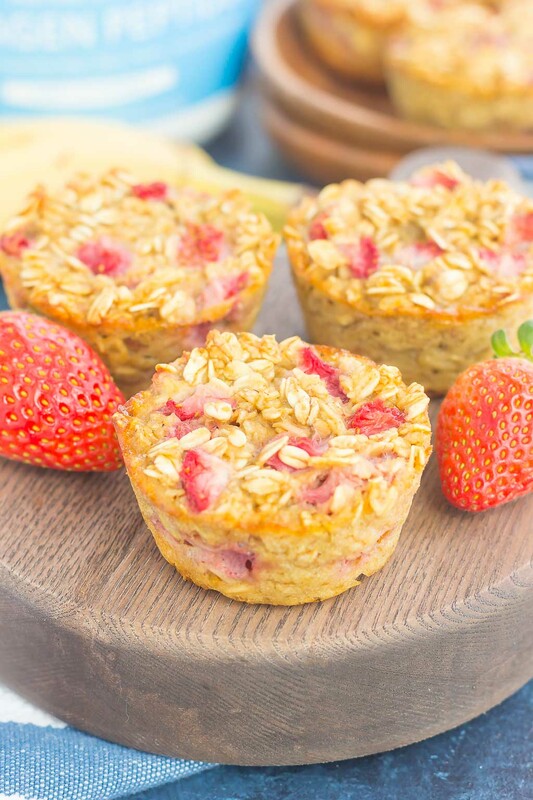 And like most of my recipes, these Strawberry Banana Baked Oatmeal Cups are easy to make. You’ll whisk together the dry ingredients, followed by the wet, and then combine the two. 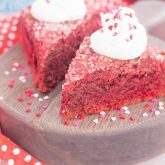 Fold in some fresh strawberries and scoop the batter into a muffin tin. Pop it into the oven and get ready to be wowed. The flavor, the texture, the good-for-you ingredients, these oatmeal cups have it all! You could also make a batch of these on the weekend and then pop them into the fridge for an easy, grab-n-go breakfast during the week. Or, freezing them works well, too. You pick! So grab those ingredients and whip up this easy and oh-so delicious breakfast. Your tastebuds will thank you! Looking for more oatmeal recipes? I’ve got you covered! Preheat the oven to 350F. Grease a 12-count muffin tin with non-stick cooking spray. Set aside. (See note below). In a medium bowl, combine the old-fashioned oats, brown sugar, Vital Proteins® Collagen Peptides, baking powder, and salt. Set aside. In a large bowl, whisk the milk, eggs, vanilla extract, and mashed banana. Pour dry ingredients into wet ingredients and stir until thoroughly combined. Gently fold in diced strawberries. Spoon mixture into each muffin tin, filling almost to the top. Bake for 30-35 minutes, or until cups are set and golden brown. Remove from oven and let cool for 10 minutes in pan. Then remove to a wire rack and let cool completely. Serve with a drizzle of honey or maple syrup, if desired. Using a silicone muffin tin makes removing the oatmeal cups so easy! These muffins look just MARVELOUS, Gayle!! I'm loving the strawberry banana combo! And the fact that you added vital proteins?! SO MUCH YAASSS! These are just breakfast perfection, my friend! Pinning! Cheers! Thanks, Cheyanne! I'm loving baked oatmeal these days! I love baked oatmeal in every form and the strawberry-banana combo is a favorite of ours! These look like the perfect breakfast, especially with the addition of the Vital Proteins! Thanks for the oatmeal love, Marcie! Love that you added protein to these! They look amazing! Can't wait to make them ! This is a perfect breakfast recipe, Gayle! I love the combination of ingredients which make them a perfect post-workout snack! Thank for the oatmeal love, Agness! Wow! These baked cups are an amazing breakfast idea. I love oatmeal anything for breakfast. And these here look so healthy and appetizing, with my fave. flavors in it. Thanks for this recipe. Thanks for the kind words and for stopping by, Neha! I don't have the collagen pesticides. Is this vital to the recipe? Hi Kiesha! No, you can definitely make these without the peptides and you will notice no difference. The collagen peptides just add more health benefits, without any flavor. Hope you love these and thanks for stopping by! That's great, Kiesha! I hope you love Vital Proteins. I use it in my coffee every morning and I really have noticed a difference with my hair and joints. Thanks for letting me know! I really like the taste of outmeal. I would love to add a mix on it. I will save this for future reference. Hope you like this if you try it, Jack! My baby loves these muffins and the apple ones! 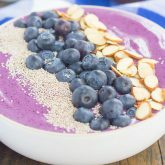 Such an easy breakfast/snack solution! I used ready oats because that’s all I saw at our store. Do the old fashioned oats cook differently? Thanks for sharing this recipe ???? Hi Josie! I'm so glad that you like these oatmeal cups! They're a favorite of mine too. The old-fashioned oats just give it a thicker texture in my opinion, where quick oats are ground a little finer. Thanks so much for letting me know how you liked these!